So, going to the store or even driving around town can be unpleasant lately. We settled on pumpkins for our October decorations because Halloween is a bit intense for a sensitive 3 year old. She likes skeletons, spiders, and even blood, so some of it is not a problem. But there are still plenty of ghosts and really creepy imagery. Not to mention people who like to scare small children. 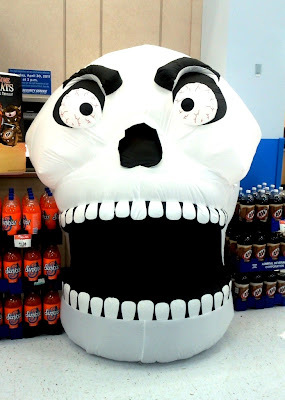 Today at Wal-Mart, Bridgette was truly scared of the Halloween aisles. I skipped the slasher masks and tried to avoid anything that would freak her out. All I needed to buy was some face-paint, but even the example images on the packaging were grotesque! Add in the spooky music they were playing, and she tried to curl up and hide in the shopping cart. Even after we left the aisles, Bridgette had a tense expression and continued to say, "Mommy? Scaaary." As we checked out, this huge blow-up skull was at the end of the line (pictured below). Personally, I can't think of a better way to advertise soda bottles... ? Well, I'm imagining a long night awake with my nightmare ridden daughter, when she pipes up. "Mom! Look! A happy face!" 2) she couldn't eat any of the candy or chocolate or raisins, etc. She still can't eat any of that stuff, but we think she would like the process of collecting it. 3) putting my sensitive child in the position of being terrified. We've been working really, really hard to overcome her fears of "the nighttime," and she's just starting to sleep well again. For those of you who have dealt with your own children and their very real fears, how in the world do you go about surviving Halloween? Thanks! I'd really appreciate some responses! We just avoid the houses that scare Ellie. Most of the time she is fine with the "scary stuff" at a distance, but she lets us know when we are too close. Last year was Ellie's first time trick-or-treating and she really liked it and asked to go again for weeks afterward. I think Bridgette will be just fine trick-or-treating, scary decorations and all. They aren't nearly as intimidating, I think, when there are lots of other happy kids running around door-to-door. As far as the candy goes... Our dentist will exchange kids' Halloween candy for prizes, maybe yours does the same? Arm her with a sword to take out the bad guys. Oh, yes! I hadn't thought of that Mom! Not only is it a great idea, but she will actually have a sword with her costume. I bet that will help immensely. I think you bring up a good point. There are certainly lots of scary things associated with Halloween, but surprisingly, it's really never been an issue for our kids. There's never anything scary about their own costumes - masks aren't allowed at church parties - and we usually start our trick-or-treating before it's even dark which helps. It's not too hard to avoid the scary houses and I don't feel like the teenagers with potentially scarier costumes come out until later. One good thing about trick-or-treating early is that we can then sort through their candy and give away all the stuff we don't like to the kids that come to our house. If Bridgette really can't have anything, you could let her enjoy the experience of collecting candy, choose one thing to keep for herself (you and Jeff choose what you want) and then give the rest away to the kids who knock at your door. Our kids love passing out the candy almost as much as they enjoy getting it. Sounds like Bri's new enough to the holiday that she wouldn't know that other kids actually keep their candy. Can't wait to see the pics of your family dressed up! I agree with the above. Just avoid the scary houses and go to the ones with pumpkins and scarecrows for decorations. Or maybe your city does a business trick or treat thing? I know ours does and it's really nice, especially for the little ones. Loved what Tammy said and totally agreed with it all! In the past, we've avoided the scary houses. There would be a few that she's start going up to and then turn around once she saw a scary costume or something jumped out. She'd say, "That was weird!" but would never be really frightened like poor Bridgette was in the store. Poor girl! This year, Sophie actually likes the scary things that I think are really creepy. When we go walking each morning and pass the freaky houses, Sophie says, "It's ok, Mom. Girls can like scary things too!" Of course, her thoughts could completely change seeing them at night! You can come to our trunk or treat at 3:00 on the 31st. They will have alternatives like toys for those with allergies. I don't remember any really scary things in the past years and it's during the day time.